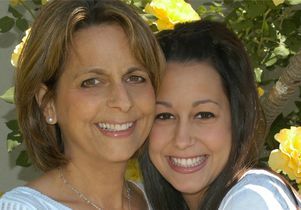 Paulinda Babbini and her late daughter, Robin Babbini, who died of ovarian cancer at 20. When Paulinda Babbini’s daughter, Robin, was diagnosed with ovarian cancer in 2004 at age 17, the mother’s first reaction was shock. Robin was a typical, active teenager and honor student, co-captain of the cheerleading squad, homecoming queen and involved in the dramatic arts. How could her baby have cancer at 17 — worse, stage three ovarian cancer? But Robin did have ovarian cancer, a disease that will strike nearly 22,000 American women this year alone, killing more than 14,000. Ovarian cancer accounts for 5 percent of cancer deaths among women, and causes more deaths than any other cancer of the female reproductive system. Mother and daughter decided to fight and face the daunting disease together. As part of her treatment, Robin underwent a total hysterectomy, followed by chemotherapy treatments. Unfailingly optimistic, Robin completed her classes, graduated from high school and began her freshman year at the University of California, Santa Barbara. But six short months later, Robin’s cancer returned. She underwent another surgery, during which doctors discovered the cancer had spread. She fought on, joining the Kappa Kappa Gamma sorority and continuing her studies. She served as co-captain of her team at the American Cancer Society’s Relay for Life event. And despite her weakened condition, Robin gave a gut-wrenching, inspirational speech, hoping that one day there would be a cure found for ovarian cancer and no one would have to suffer like she had. Just six weeks later, Robin lost her battle with ovarian cancer at 20. Babbini vowed that her daughter would not die in vain. Single-handedly, the grieving mother in 2010 launched the non-profit The Ovarian Cancer Circle/Inspired by Robin Babbini and set out to raise money for ovarian cancer research. All the money she raises goes to fund the work of Dr. Sanaz Memarzadeh, an associate professor of obstetrics and gynecology at UCLA and director of the G.O. Discovery Lab at UCLA. The donations from The Ovarian Cancer Circle/Inspired by Robin Babbini have enabled Memarzadeh and her team to make critical steps in understanding why ovarian cancers are not detected early and why these tumors often relapse despite surgery and chemotherapy. Ovarian cancer is known to be highly responsive to chemotherapy, but the reasons for its relapse despite an initial good response to chemotherapy had remained unknown. Recently, by studying patient tumor samples, the G.O. Discovery Lab team has identified a subpopulation of ovarian tumor cells that are resistant to chemotherapy. They believe these chemotherapy-resistant tumor cells, called serous cancer stem cells, are the culprit for high rates of relapse in ovarian cancer patients. Because of her findings, Memarzadeh said she believes the future is very bright and one day there will be a cure and early detection for ovarian cancer. Efforts by Babbini and her team have made this work possible, Memarzadeh said. The G.O. Discovery team is actively seeking funds from other agencies such as the American Cancer Society, the Phase One foundation and federal funding sources to help leverage and multiply every dollar raised by Babbini and her team. Recently, the organization held its fourth annual fundraiser featuring comedians at the Comedy Store in West Hollywood and raised $36,000 for Memarzadeh’s lab. To date, with an all-volunteer organization, Babbini and her team have raised more than $120,000 to fund ovarian cancer research at UCLA.